Photo Dora Somosi. Courtesy Edward Cella Art and Architecture. For Alex Schweder, buildings happen in time. The architect and artist bridges the gap between performance and architecture, suggesting that architecture was always already a field concerned with performance, from the way we shape space to the way it performs on us and guides our interactions with others and the space itself. 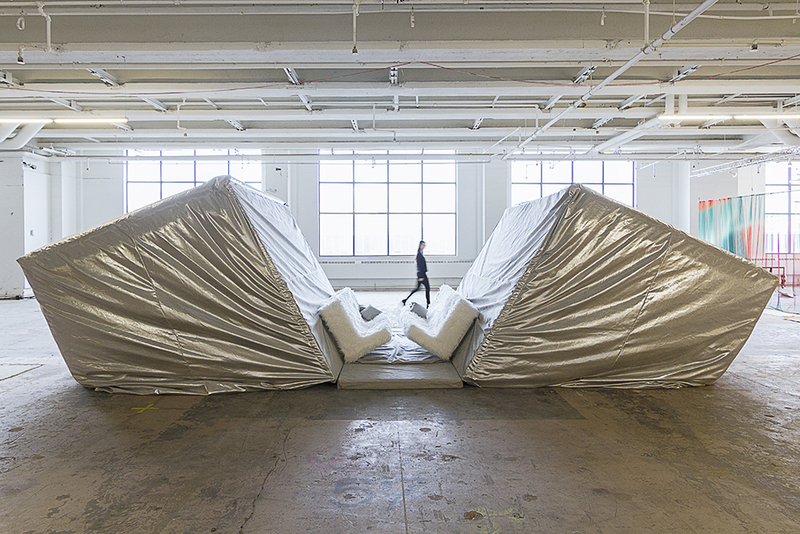 During Armory Week, New York City’s spring collection of art fairs centered around The Armory Show, Schweder is exploring these ideas of architectural performativity with two different installations in the city. Schweder’s piece Davenports Yawn is on view as part of Collective Design. 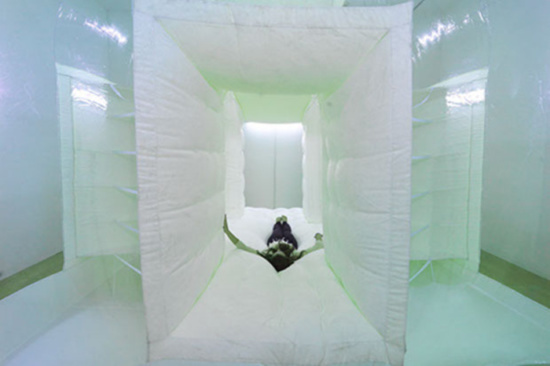 The installation was inspired by his 2013 piece for the Lisbon Architecture Triennale, Slowly Ceiling, and it continues his use of inflatable architecture. Davenports Yawn is a soft, inviting space where strangers face one another in a moment of respite and architecturally scripted intimacy. Davenports Yawn was curated by Rozalia Jovanovic and made in collaboration with Davide Quadrio at materials manufacturer Alcantara, who commissioned the work. Photo Sina Basila. Courtesy Edward Cella Art and Architecture. Across town at the Armory Show is My Turn (2018), presented by the Los Angeles gallery Edward Cella Art and Architecture. 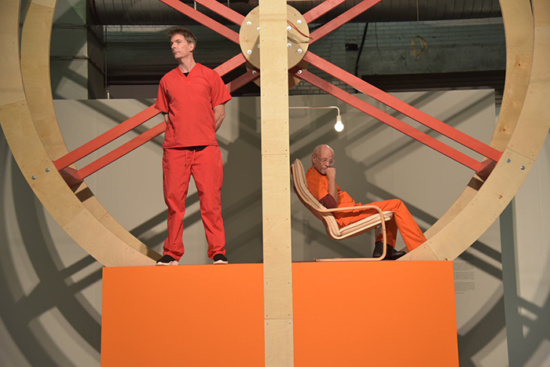 A collaboration between Schweder and Ward Shelley, the piece premiered as part of Armory’s Platform program, which is dedicated to large, site-specific works. My Turn is a 16-foot wheel with two platforms to be occupied by Schweder and Shelly each day for eight hours during the fair. As its name suggests, the turning wheel requires taking turns. 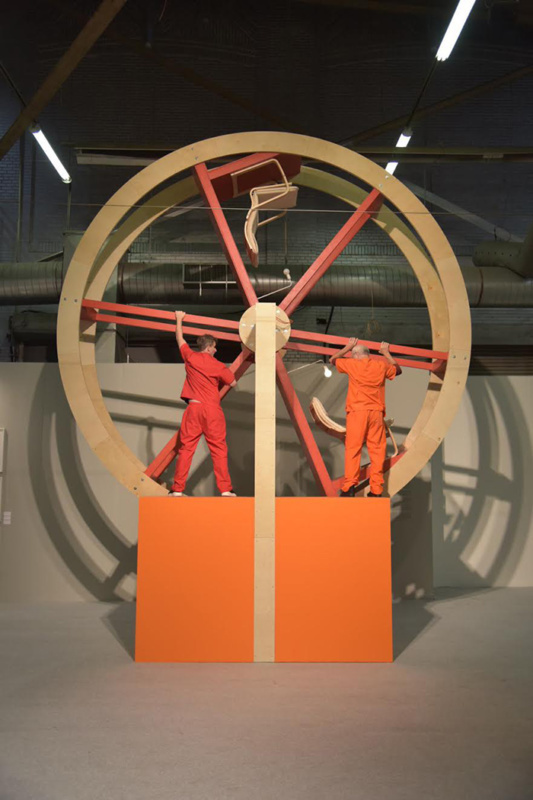 By design, both artists cannot sit on the wheel at the same time. The “my” in My Turn becomes a point of contention. This constant negotiation around the wheel explores the dynamic between the environment, built or otherwise, and humanity. Its structure is one of inherently restricted capacity. The wheel becomes agentic precisely by delimiting the agency of those who use it—here, ironically, its own designers. It begs the question: who (or what) is actually in charge? My Turn looks at the delicate balance of building our world and living among each other, especially in a time of ever-shrinking resources and ever-growing populations. Davenports Yawn and My Turn will be on view through the end of the fairs, on March 11.